Lineal meters is purely just the length of the item, with no thought given to height, if you laid out the items end on end you’d end up with the lineal meters value for the item. Square meters, on the other hand, describes how much area the product would cover if you laid it out, as such it is a multiplication of its height x width. To get an idea of the difference… here’s 130 lineal meters of skirting boards, doesn’t really take up that much room does it? It fit on the roof of the car (and may have scratched the buggery out of it when it slipped off when I stopped quickly at some lights, but that’s another story), and I brought it into the house in seven lots. 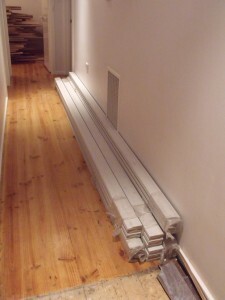 This is enough to do the whole house and then some and, at $2.50 a lineal meter, cost $325. 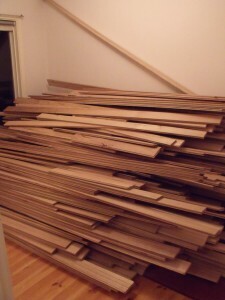 Now, here is 140 square meters of Tasmanian oak floorboards…. almost the same ‘number’ but a whoooole lot more wood. This weighs almost 3 tonnes and was brought in two large pallets aboard a very large truck. It took myself and my father-in-law a couple of hours to bring this lot into the house.